Like any industry in America, the healthcare industry faces many challenges. Recruiting and retaining qualified physicians, driving revenue growth, and encouraging employee engagement are among the most compelling overall. But, for many healthcare finance administrators, revenue cycle challenges are equally daunting. One reason for this is the constant struggle to collect payments from patients, which makes it difficult to maintain a low ‘Days in Accounts Receivables’ (DAR) rate. If this struggle sounds familiar to you, then Epic River is here to help. Our innovative healthcare billing solutions benefit patients and medical practices alike. 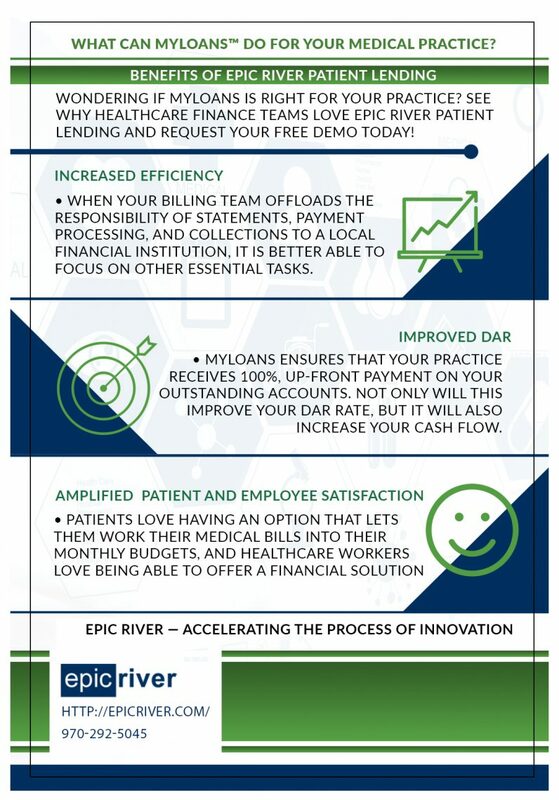 Thanks to Epic River MyLoans™, patients can secure low-interest, fixed-rate, and non-predatory medical loans from local banks without a credit check. Additionally, medical practices like yours can receive payment upfront and in full, while streamlining billing processes and significantly lowering DAR. Check out the benefits outlined below and then contact us to request your free demo! Oh, and did we mention our product is free for medical practices? Your medical billing team is an integral part of your practice. In order to achieve optimal results, team members must be able to perform their jobs efficiently. From coding and charge entry to insurance and patient follow-up, there are countless tasks that this team is responsible for on a daily basis. The additional responsibility for collecting payments on unpaid accounts can be daunting, demoralizing, and time-consuming — and unsuccessful to boot! The Epic River MyLoans platform quickly transfers this responsibility to a local partner bank that has expertise in loan servicing. Offloading this task to the collections experts — the banks — can give your billing team back the time it needs to focus efforts on other essential tasks. Medical practices need readily available cash flow just like any other business. When your practice has to cough up funds for new exam tables, upgraded technology, or additional employees, you need at least some measure of liquidity to make these purchases. Having a high DAR rate could drastically limit your cash flow while increasing the time between patient treatments and medical bill payments. With MyLoans, your practice receives 100%, up-front payment of patient charges in a fraction of the time that you would otherwise. In fact, recent case studies have documented a several-day reduction in DAR for medical practices. Patient and employee satisfaction is important to your practice. Too often, patients are subject to undue financial harm or predatory practices in order to get the medical services they need. 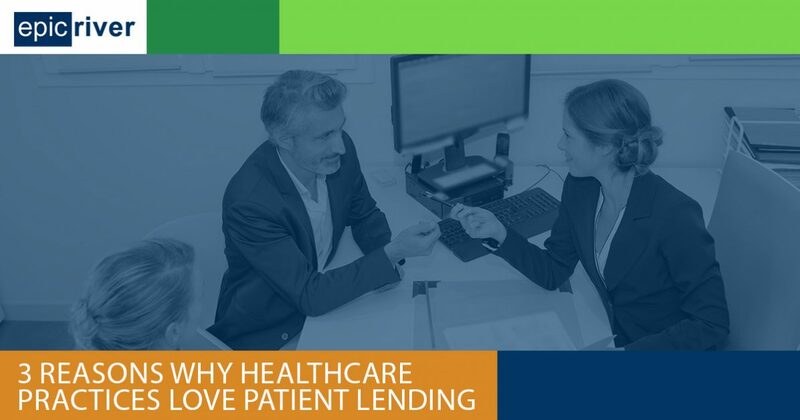 When your practice offers patients a viable healthcare finance solution via our revolutionary patient lending platform, they will likely feel more comfortable getting the care they need. These medical loans can also help them build their credit without the risk of financial harm, leading to increased patient satisfaction. What’s more, many practices report increased employee satisfaction because healthcare workers appreciate having an effective finance solution to offer patients who otherwise may be unable to afford their care. Are you looking for an administrative solution that streamlines your practice’s billing and collection processes? If so, then look no further than the Epic River MyLoans platform. MyLoans enables your billing team to offload statements and payment processing and ensures 100%, up-front payment on your outstanding accounts. Contact us today to learn more. We can’t wait to help you!